Standards and safety | EUCHNER – More than safety. We offer implementation information to help you apply the relevant standards and laws for the protection of machinery and systems. The new guide assists in the application of the EN ISO 14119 standard. The procedure for selecting a suitable interlocking device with and without guard locking is demonstrated systematically based on a flow chart. Step by step, all key content of the standard is addressed and conveyed to the user based on questions and answers as well as various examples. Would you like a printed copy? Simply use our contact form to order one. The new DGUV information brochure 203-079 covers how to select and mount interlocking devices. It provides information and suggestions for implementation in compliance with the standards. 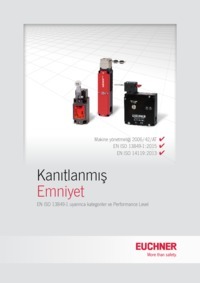 The brochure is intended for design engineers and manufacturers of machines and installations. This report describes the essential subject matter of the standard and explains how to apply it, based on numerous examples from a range of areas. Published by DGUV. The report is only available as a printed version. Please request it from us using our contact form. Are you a machine manufacturer or system integrator, or do you convert machinery? Then here’s what you need to take into future account in relation to functional safety – Notes on the application of standards EN 62061 and EN ISO 13849-1. Published by ZVEI. Download the latest version of the SISTEMA software from the IFA page.